A comprehensive manual revealing step-by-step procedures that any real estate company, no matter what size, can follow in forming a relocation department. 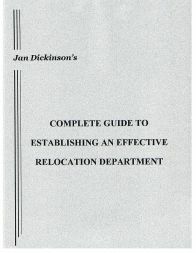 It asks and answers the most vital questions concerning relocation departments. Also includes sample forms. Most real estate brokers belong to a referral network or at least participate in informal broker-to-broker referrals. Those clients who are moving outside of the service area of one broker are referred to another broker in the area they are relocating to. If the receiving broker is successful in either selling their current home or selling them a new home, the originating broker is paid an agreed upon referral fee. These fees usually range from 25% to 40% of the gross amount of the listing or the purchase transaction. The department organization and operation of a relocation service is thoroughly covered, as well as instructions on how to interface with real estate relocation coordinators. Counseling the transferee is detailed in a script format to give instant training to relocation counselors. Record keeping and tracking the real estate referral from sale to close is done in the same fashion as that used by most professional real estate relocation departments. This will allow center personnel to speak the same language the real estate agent and relocation coordinator does, making the association more comfortable for everyone.